CPCS, while busy with distribution of relief materials all over the country, is still focusing on its core buisness/missions, support, rehabilitation and prevention. 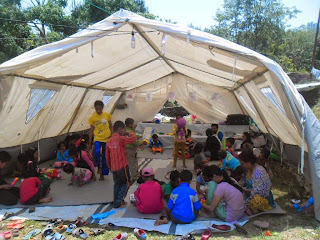 The earthquake will directly or indirectly direct many new children to the streets of Nepal. Prevention has to be done with families, we have to focus against unnecessary institutionalisation, risks of traffic, separations of family, etc... but we also have to response and ensure protection the children who are on the streets now... who need care and back support... !!! The paradox is indeed terrible: society rejects street children because they are unsociable, and the children are unsociable because society rejects them. They are still children, but they’ve had to adopt some adult behaviors in order to face their difficult environment. Feeling unaccepted by society, they form a parallel society with its own codes, its language features and its own rituals, which includes sniffing glue and taking other drugs.